Easily shape up facility exteriors with a stylish and secure Triangle Hinge Bike Rack. The exemplary security that entailed in a two point wheel and frame locking, are creatively displayed by the distinctive hanging triangles. These welded triangles are strategically spaced across the top rail, provides easy entry and exit from either side of the rack. Its' solid, one piece, freestanding construction allows simple portability, allowing it to be placed on a variety of surfaces like grass, dirt, sand and concrete. Units are capable of securing up to 10 bicycles. The high versatility, geometric design and clean curvy lines makes this model highly popular among college campuses. Our imported, precision bent, Triangle Hinge Bike Rack was developed using commercial grade 2-3/8" O.D. steel tubing. 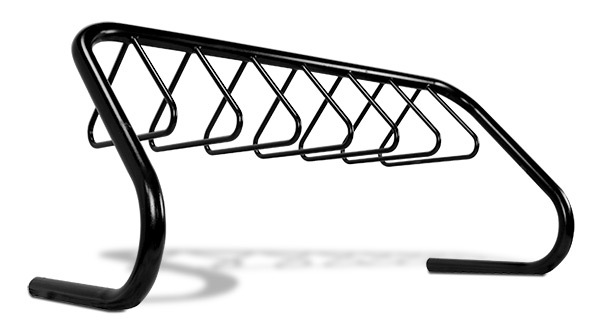 Sealed in a high grade powder-coated finish, the rack is protected against tough weather conditions allowing the bike rack to look new, year after year.